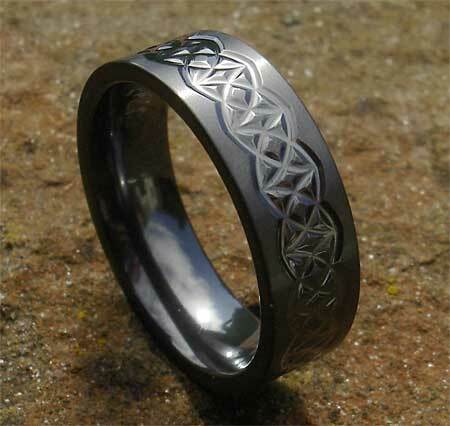 Men's Celtic Black Gothic Wedding Ring : LOVE2HAVE in the UK! A 7mm wide, men's Gothic wedding ring in all over black with a beautiful interlaced Celtic styled outer engraving. The external patterning on this ring is that of an interlaced half circles pattern that repeats around the entire outer edge. The ring pictured, shown in a satin finish, but a polished version is also available. 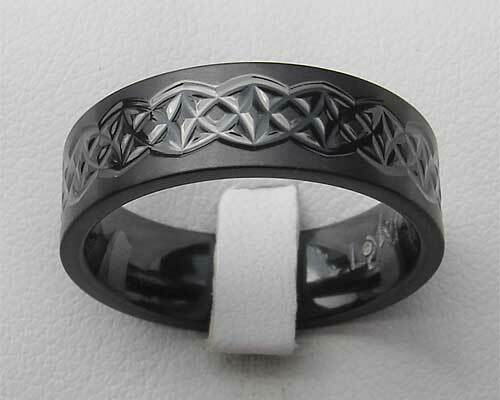 As a great alternative wedding ring, this is a black Celtic wedding ring made from zirconium. Some might say a Gothic wedding ring, but it can be worn just as a fashion piece too. Zirconium is the only choice if you are looking for an all-black British made men's ring. Anything else you find that is not zirconium will be imported and remember; we can offer you an after-sales service on the rings you buy from Love2Have. Profile(s) Available: Flat comfort fit. Finish(es) Available: Polished and satin matt. Returns Policy: You may return this UK made men's Celtic ring if it is not to your satisfaction as long as it is not engraved. Please see our terms and conditions.